Summer is here and as we get into the swing of well planned scheduled fun activities (Ok, more like winging it on a day to day basis and hoping the sun keeps shining), the slower pace of the day has helped me reflect on how the years gone so far. Little Z has settled into pre-school and cracked potty training. He’s also discovered his natural talent for turning everyone into a frog and the art of story telling as he sits on the loo and makes you listen to long epic thrillers, the most recent of which include his Nani falling into a mountain or a big fish making a shocking appearance out of absolutely nowhere. The carpet outside the bathroom is being worn away from my parked bum appreciating his exciting sagas. The year so far as been filled with lots of proud moments, in all shapes and sizes. And as I reach “mid 30s” over the coming month I know I have a lovely little family that keeps me in stitches and frazzled in equal measure. With death and destruction currently prevailing in the mad world we live in there’s nothing like looking at your family and surroundings and being genuinely grateful for everything we have and the security we take for granted. So this week my loud n proud is a million little things that build up our tiny but lovely little family. As we all sail into the lovely long summer days and hopefully have a lot of fun, the Loud n Proud crowd has decided this will the last Loud n Proud for the summer. It will return on the 4th September and will be hosted by the lovely Suzanne from 3 Children and It. 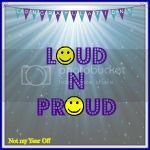 So for the last Loud n Proud come link up all your posts filled with any kind of proud moment. Small, big, old or new, all are welcome. Grab the badge below and come link up all your favourite or new posts. And of course have a very lovely summer if you’re a Loud n Proud regular and see you in a few weeks! What a lovely post. So true that we should be grateful for the small things in life, particularly when there are so many awful things going on in the world. Yes! So many tiny things to be proud of, that add up to the wonderful families that we have. Also, it sounds like you should get Little Z to pitch some of his story ideas to Hollywood executives – they’d make great films. Katie @mummydaddyme recently posted…Me and Mine: A Family Portrait Project 2014- July. Lovely post, you do have so many things to be proud of! I love that he turns people into frogs and tells you epic stories!